Every girl reaches an age when she puts down the crayons and starts playing with beauty products or whatever. Unless you’re me. If you’re me, you still eat crayons, Play-Do, glue, or anything else you find in the craft bin. Annnnd the neighborhood kids still throw rocks at you. Some things never change! 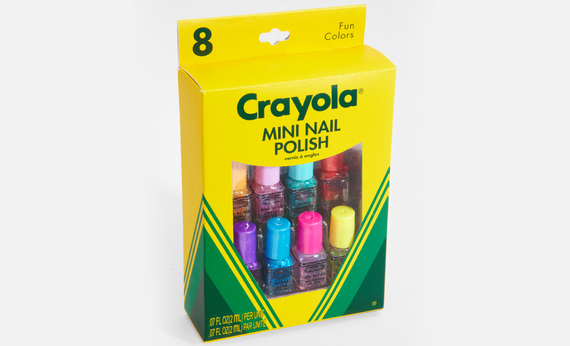 But for everyone else, there’s Crayola Nail Polish. The classic crayon-inspired polish is available for pre-order with August 13 as the projected ship date. But…but what if I can’t wait that long?! I’ve got 21 nails (still rockin’ the spare toe!) that need to get did. I noticed the set surprisingly does not contain black or brown polish. I guess little girls don’t want goth black or doo-doo brown nails anymore. Kids these days, amirite? When I was growing up I took whatever color I could possibly get and I liked it!